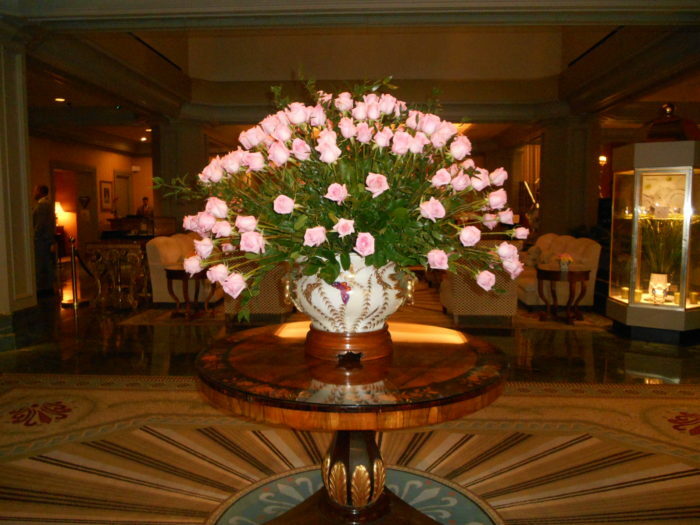 On a recent long weekend to New Orleans, we enjoyed sampling much of the magic and mania of the city but as soon as we entered the lobby of the Windsor Court Hotel, we knew we were in another world. This grand hotel is in the heart of New Orleans, just a couple of blocks over from Bourbon Street yet it’s an oasis of refinement and repose. That’s just like New Orleans. A little bit of something for everyone. Right off the lobby is Le Salon with it’s upholstered chairs and cushioned sofas that offer a place to linger in comfort. 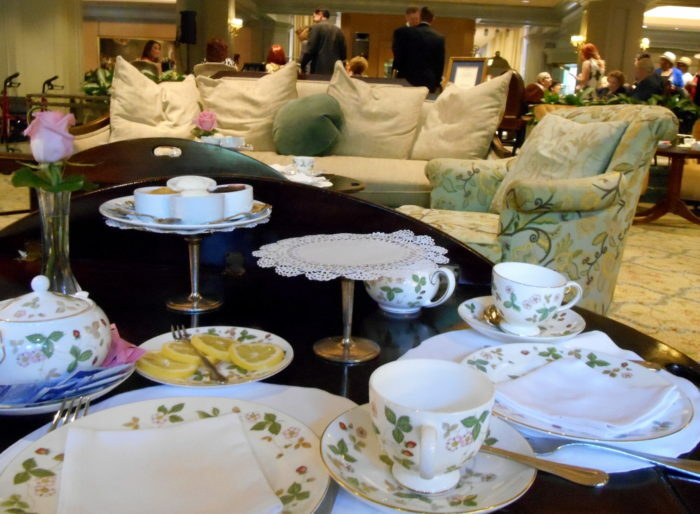 The tea table was attractively set with Wedgwood’s Wild Strawberry bone china. There is a very wide variety of teas to choose from. The pots are bottomless and you can try as many of the teas as you like. 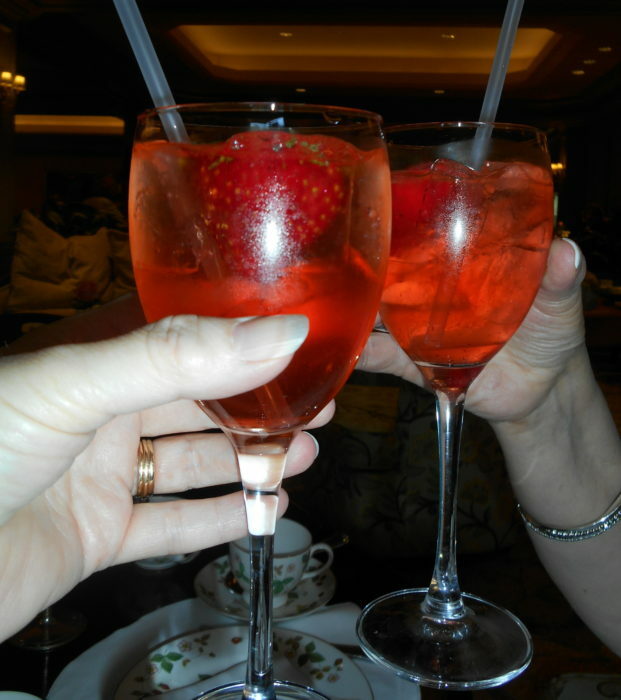 Strawberries and Champagne – a delicate long leaf white tea flavored with strawberries, champagne, and rose petals. Emperor’s Hibiscus Oolong – This high mountain Taiwanese oolong is light and a bit fresh and grassy. Scented with biodynamic (It’s a thing. I had to look it up myself.) Egyptian hibiscus. 2001 Vintage Oak Barrel Aged Pu-erh. The menu says this tea was “plucked from Ancient tea trees that are 400-1400 years old. They are grown wild, creating an infusion that is rich and complex. This rare tea is oaked in barrels 3 years before fully curing to mellow the tannins.” How cool is that? 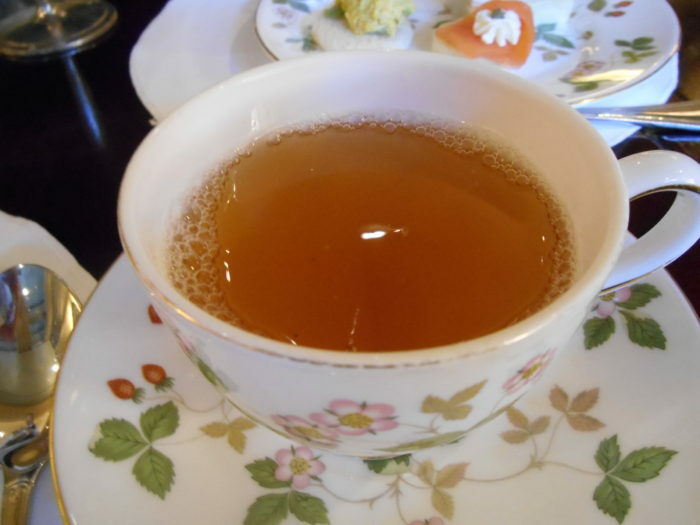 Like most Pu-erhs this tea is very earthy – almost mossy, mushroomy tasting. It was smoother than most and was good with a bit of milk and sugar. The savories course was a treat for the eyes and the tummy. Starting from the top and going clockwise: We had a smoky, honey sweet turkey garnished with a bit of yellow bell pepper, truffle egg salad, lobster salad on a cucumber slice, cucumber on rye with a dilled cream cheese spread, smooth and salty smoked salmon topped with a caper, and curry chicken salad. Our scones (one black currant, the other walnut) were served with seedless raspberry preserves, Devonshire cream, lemon curd and vanilla bean whipped cream. 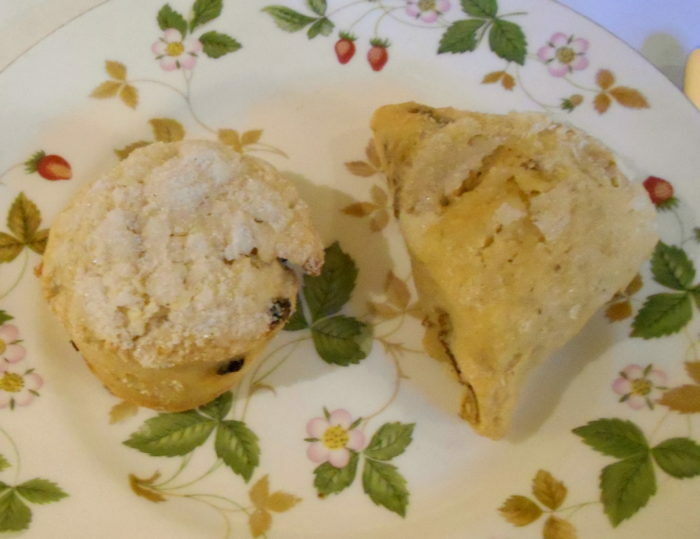 I tried them all on top of these tender, chunky scones. It seems like we had gallons of tea and mountains of food and then they brought out dessert! Thank goodness, this was the serving for both of us because at this point we were just about done for. A taste here and a taste there just to say we did and the we boxed up the rest. 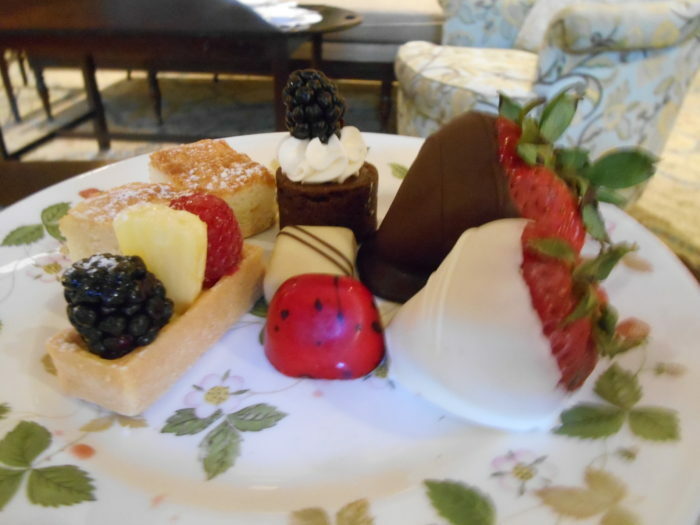 The dessert consisted of a miniature cake, a fruit tartlet, lemon bars, truffles, and chocolate covered strawberries. The strawberries were not fresh, as you can see in the picture. This was the only minor infraction we encountered along the way but everything else was so delightful that it really didn’t bother me. New Orleans and tea are best when shared with friends. This lovely lady and I frequently talk about how much we want to spend more time with friends and just enjoy life. So that’s exactly what we did all weekend! The tea, the food, the atmosphere were all so very lovely. The icing on the cake was the captivating piano music played by Julliard trained Rachel Van Voorhees. Here’s a detailed article if you’d like to know more about the music you’re listening to. 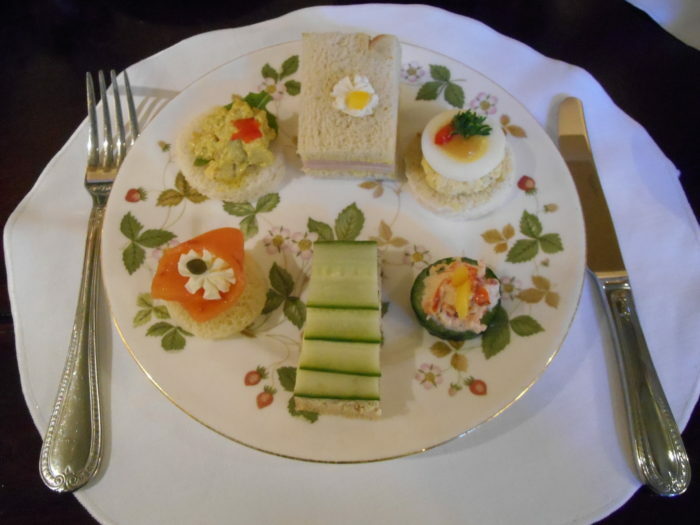 I highly recommend afternoon tea at the Windsor Court in New Orleans. Well worth the $31-$50 you’ll spend. It’ll give you a delightful break to catch your breath so when you head back out you can go full throttle again. 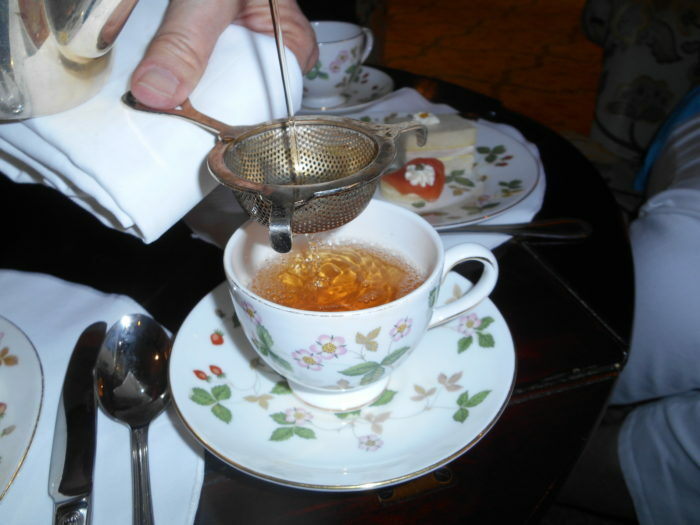 And, if you’re a tea lover like me you’ll revel in their top-shelf tea selections with 26 to choose from. It seems that they were carefully curated to provide a full representation of the rainbow of teas available in the world. Beautifully written. I learn something new each time I read your blog. Sounds wonderful and great pictures. Thank you. Photography is a challenge for me but I enjoy learning!